The roads have seen better days and probably so too have the villagers, but if events continue to be held in a small ethnic Azeri village in Georgia that might all change. 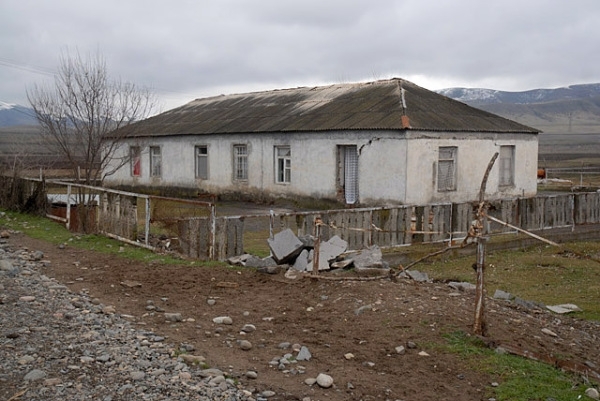 Situated just 10 kilometers from the Georgian border with Azerbaijan, and 29 kilometers from the crossing with Armenia, those attempting to establish Tekali as a regional peacebuilding center certainly hope so. One of them, Armenian theatrical director turned activist Georgi Vanyan has already called on other NGOs to relocate some of their existing and future regional and cross-border projects there. If that were to happen, much needed investment could be attracted to Tekali as well as the surrounding area and involve wider society in dialogue, discussion and debate. And there’s certainly the need. Locked into a bitter conflict over the disputed territory of Nagorno Karabakh, attempts by the OSCE Minsk Group to mediate between Armenia and Azerbaijan have failed to produce any significant breakthrough in nearly 17 years since the 1994 ceasefire put fighting on hold. Around 25,000 were killed and over a million forced to flee their homes. By the time of the armistice Armenian forces were left in control of around 16 percent of what the international community considers sovereign Azerbaijani territory. Around 3,000 have since been killed in cross-border skirmishes according to The Economist, leading to concerns that war might break out again. In January, for example, the International Crisis Group warned of the danger of an accidental war while others question whether there is the political will on either side to resolve a dispute which arguably threatens the stability and future economic development of the entire region. For those such as Vanyan, there are also doubts that the current OSCE mediated negotiations are sufficient. Even civil society has largely been content with holding often closed meetings in hotels or holiday resorts in third countries such as Georgia although such an approach reaches only a small number of people. Rather than only involve what could be considered an 'elite' in both societies, they argue that a more open and grassroots approach is necessary. Having already held his own events in Armenia, including a cultural project at a school in the capital as well as an ill-fated attempt to host a festival of non-political Azerbaijani films, the first event to be held in Tekali occurred on 9 March 2011 and was attended by Armenians, Azerbaijanis and Georgians. A 'moot court,' an event simulating judicial proceedings, was staged to discuss the potential role of Georgia in bringing peace to its two estranged neighbors. Intended primarily for journalists and analysts, the event also attracted and involved representatives from war-affected Armenian communities close to the border with Azerbaijan as well as from Georgia's own ethnic Azeri minority. The meeting was chaired by Vanyan alongside expert David Darchiashvili, Chairman of the Commission on European Integration in the Georgian Parliament. A panel of analysts and journalists making the case for and against Georgia's involvement in the Armenia-Azerbaijan negotiating process offered their opinion with questions taken from the audience. In general, those supporting the motion believed that Georgia's central role in the region makes it ideal, especially as most peacebuilding initiatives and projects are already taking place there. Moreover, despite the animosity usually evident between Armenians and Azerbaijanis, the two ethnic groups can and do live together in peace in Georgia which also has its own experience with 'frozen' conflicts, especially after the short-lived war with Russia in August 2008 which created a new community of IDPs to deal with. However, those opposed to Georgia’s involvement pointed out sour relations with Russia could instead increase tensions in the region. It was also considered that Azerbaijan might be more inclined towards Georgia's involvement than Armenia, which traditionally sees Russia as an ally. Even so, 27 people from the mixed audience voted for Georgia taking a more active role with 7 against and 2 abstaining. More importantly, even if few expect such a likelihood to come to fruition given the geopolitical tensions in the region, the event and the issues raised were covered extensively by the Armenian, Azerbaijani and Georgian press perhaps more so than any other civil society initiative in this area before it. What happens next in Tekali remains to be seen, but Vanyan hopes to establish a print and online newspaper dealing with the Armenia-Azerbaijan conflict in Armenian, Azerbaijani, Russian and English. A radio station based in the village, which will broadcast to audiences in the regions of all three countries, is also planned along with a cinema, library and Internet café. Cultural activities would also be included. One idea, for example, is to stage a localized version of Romeo and Juliet with an Armenian and Azerbaijani playing the lead roles. Even if unrelated to Tekali, others such as Azerbaijani film director Rustam Ibragimbekov are already hoping to secure funding to film the famous fictional love story in the context of Armenia and Azerbaijan.